Can’t remember where I found this but…this is from a manual/book called ‘How to Build a 351c Pro Stock Pinto”. There are two Gapp & Roush Pintos here. 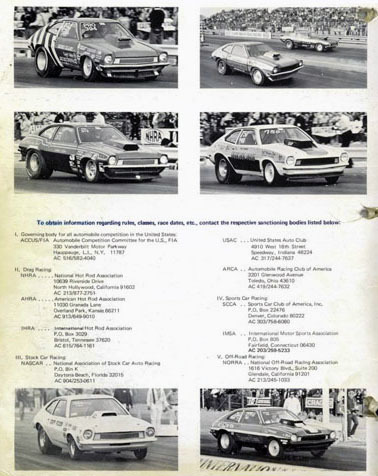 On the left hand side second from the top is the original Glidden Pinto that he purchased from Gapp & Roush. Still in the original paint except for the removal of the name. At the bottom on the left-hand side is the new Gapp and Roush pinto, the ’73 model. Unpainted on the West Coast at the Winternationals. Jeff, I’d sure like to find a copy of that book. I’ve heard of it, found a couple of pages to copy, but have not found the hard copy. There’s a pair of 70’s modified cleveland pro stock heads and tunnel ram intake on ebay this week. I’m digging around for the book. I’ll fall over if I find it. I’m looking for more blocks. Found quite a few but this is first one that I found that has been bored and beat to hell.